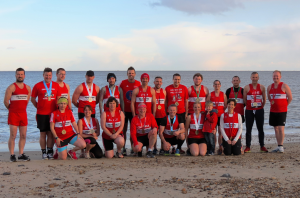 Members of local running club Felixstowe Road Runners (FRR) have brought home a haul of medals after competing in various marathons over the past month. The club, which boasts over 200 senior members saw runners taking part across the UK and Europe throughout April, including the London Marathon last weekend. 40 runners of every ability took on the infamous distance, covering 26.2 miles to achieve their own personal goals. The quickest marathon time achieved by an FRR this spring was 2 hours 44 minutes by Danny Rock who flew round the course in Manchester. The FRR female club record was broken in Manchester by Michelle Gordon who finished in a time of 3 hours 21 minutes. In Bungay, Club Captain Robin Harper achieved a big personal PB of 3 hours 12 and became the M40-44 Suffolk County Marathon Champion. A number of runners have also been taking on extreme multi-marathon challenges. Jimmy Russell completed three marathons in three weeks, taking on Paris, Manchester and Brighton. Jason Taylor will be completing four in four weeks, having already completed Manchester, Brighton and London in a staggering 2 hours 55 minutes each time. 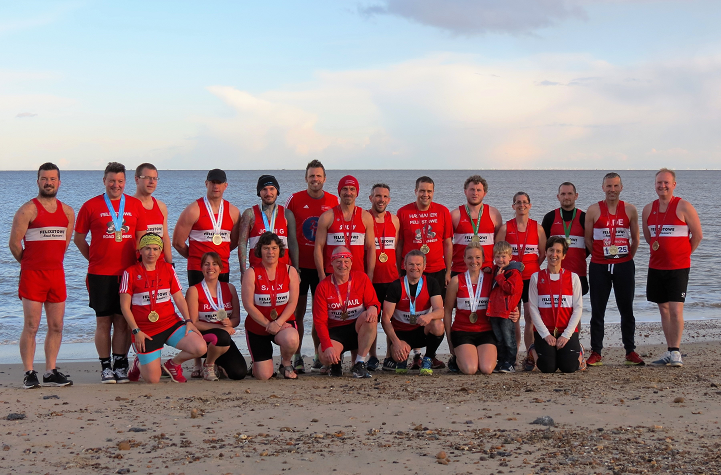 His final run takes place at the Heritage Coastal Marathon this weekend in Thorpeness. A number of runners have secured times fast enough to secure them guaranteed entry for next year’s London Marathon through the Good for Age system. Six men – Danny Rock, Dave Solomon, Jason Taylor, Darren Cook, Roger Stone and Adrian Goode and four women – Michelle Gordon, Gail Mackie, Lucy Sheehan and Sarah Proffitt will all be given places in London next year. For more information on the club, including all recent results, upcoming fixtures and how to join, visit www.frr.org.uk.